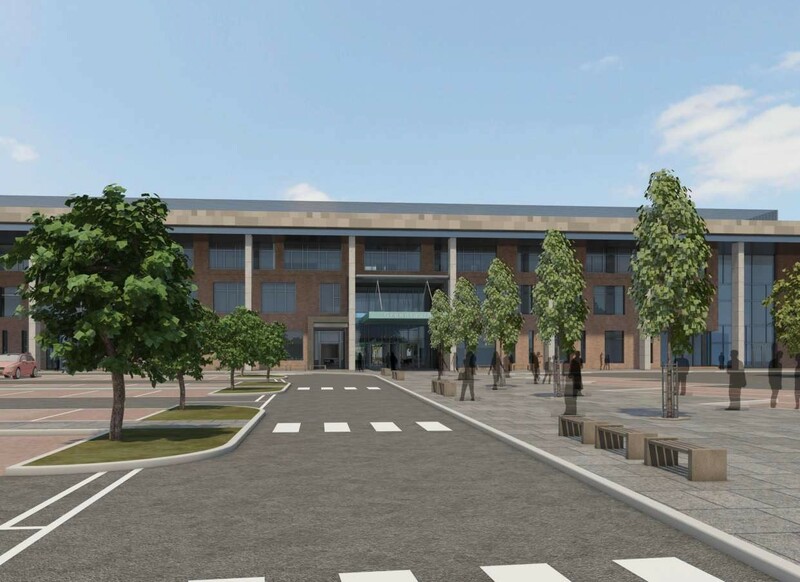 Preparatory work for the construction of Greenfaulds High School, Cumbernauld, is now underway with Morrison Construction securing the site and building a new access road for the Archial Norr designed school. 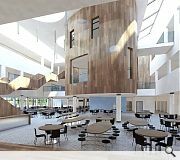 The £31.2m project will replace the existing Greenfaulds High through Hub South West Scotland for North Lanarkshire Council, creating premises for 1,350 pupils around a central hall, dining space and courtyard. 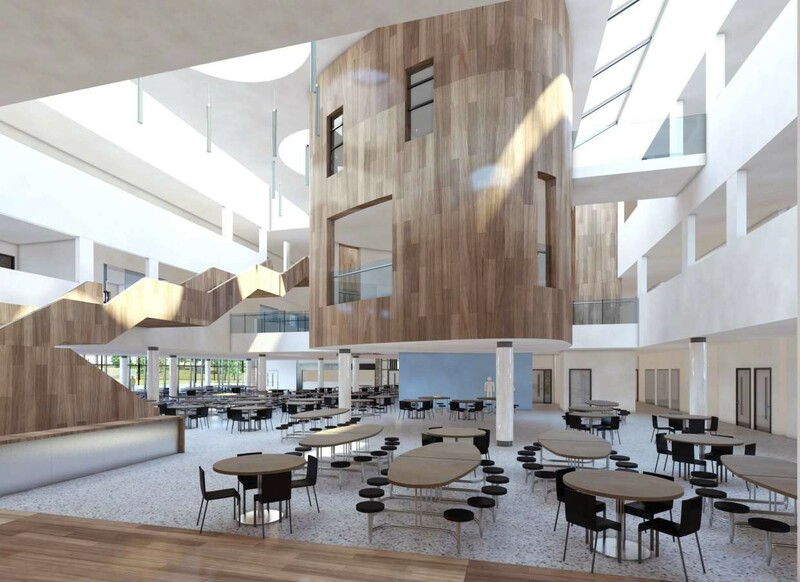 The £23.2m Clyde Valley Schools campus will be delivered in tandem in Wishaw. Please tell me I am not alone in thinking that the outward stripped classicism of this building is the very manifestation of TERROR. I know that this is North Korea (NLCstyle), but is it really healthy to induce in our adolescents such a cowed unquestioning respect for authority? Ein Volk, ein Reich, ein Führer? - just sayin, like, ken. Ah, the armchair critic. They do say that every internet chatroom discussion eventually leads to Hitler. Perhaps two posts, by the same chap, is a little soon? I do think you are being a little over-dramatic. 1. This 'chap' has never sat in an armchair in her life. 2. Your sexist gender assumption is revealing (Big Chantelle might want to have a quiet word with you). 5. You said the H word, not me. 6. Perhaps your comment regarding two posts is a little mean. I didn't think that UR had an editorial policy of rationing out comments to one per person, but I am sure if you ask them nicely, they will give your suggestion due consideration. 7. 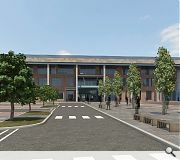 In fact, I was so offended by the external design of this school that I had sent UR initial comments which they did not print (quite rightly too). I then reconsidered and sent them the second one, but they had clearly gone (how inconsiderate of them) to lunch. So I then sent a third one distilling my argument into that #2 dictum, thinking surely they'll print just that. So you can see surely, dearest A. There is always more than meets the eye. 8. Over-dramatic? Moi? Not dramatic enough. This type of formulaic, unthinking and lazy 'professional' design gets trotted out by large machine-like practices as a matter of course and thoroughly merits all the rotten tomatoes I can throw at it. It's dreck - and they know it. They are a commercial practice. Their reason for existence is primarily to make money. There is not a sentient bone in their corporate body. 9. So, go on then A, why not add to the discussion and tell us all why you think this sort of manifestation of state authoritarianism is good for the weans? After all, this is what we are supposed to be discussing, right? 10. Now I can get back to my work. good or bad aside, i generally don't subscribe to authoritarian / classicism buildings as a precursor to Facism argument. I tend to credit our children with a little more sense. The interior is a little more enlightened, no? is this not where the weans will spend most of their time, being children, and not 'cowing to authority'? 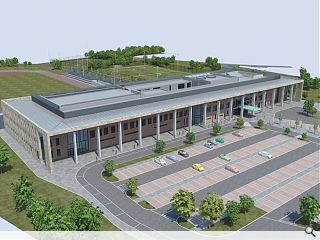 Folks, as you know, this is essentially Eastwood HS (SFT exemplar design), delivered through a separate Hub, with a slight variation on the elevation treatment. The debate here should, perhaps, focus on the merits (of which there are many) within the exemplar and slight variation therein; presumably to make the scheme more site specific. Dear Ardbeg, - does the word acronym, or even the phrase, 'nom de plume' ring a bell? Are you sure Chantelle is who she says she is? Incidentally, I agree with you - such an argument is clearly absurd, but then again that's not what I was saying was I? I purposefully never mentioned the incongruous interior (clearly designed by a lovely person as opposed to the exterior which was designed by a Neanderthal with a grudge). Given these two different authors, or God knows how many cooks there were, this is clearly not a singular work of architecture, it is a 'bulding' at best. Follow the procurement route.